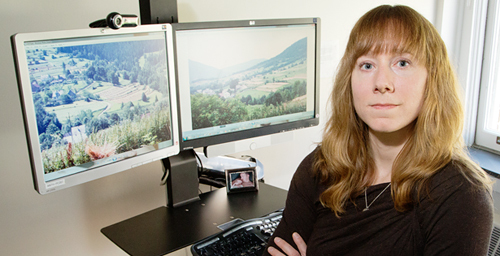 University of Illinois anthropology professor Kathryn Clancy is one of four researchers to report on the psychological, physical and sexual abuse of students during field studies at remote sites in the field of biological anthropology. The team presents its findings at the 2013 meeting of the American Association of Physical Anthropology. CHAMPAIGN, lll. - College athletes are not the only ones who sometimes suffer at the hands of higher ups. A new report brings to light a more hidden and pernicious problem - the psychological, physical and sexual abuse of students in the field of biological anthropology working in field studies far from home. "This is something that most biological anthropologists, cultural anthropologists and archaeologists see as a fairly necessary experience," she said. "Some people can do an entirely lab-based project or a computer modeling project or a local project, but most of us need to go into the field." "Overwhelmingly, we're seeing junior women being targeted by senior men," Clancy said. "Fifty-nine percent of respondents have experienced sexual harassment. Women are three times more likely to experience harassment than men. And 19 percent of respondents have been sexually assaulted." Such working conditions can have devastating effects on the health and well-being of those who are targeted and those who witness the abuse, Clancy said. They also force students to choose between their career goals and their desire to speak up for themselves or others. The researchers are proposing that funding agencies such as the National Science Foundation and the National Institutes of Health require the same kinds of protocols and oversight of researcher safety in the field that are routine in the laboratory. Co-presenters with Clancy at the 2013 AAPA meeting are Julienne Rutherford, of the University of Illinois at Chicago; Robin Nelson, of the University of California at Riverside; and Katie Hinde, of Harvard University. All are tenure-track faculty members in the field of biological anthropology. Clancy is the author of Context and Variation, a Scientific American blog.